The wool is obtained mainly from animals like sheep, yak and goat. 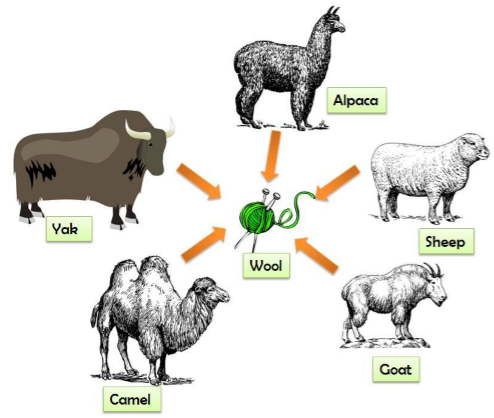 Wool is acquired from the fleece or hair of these animals. Wool is made from the soft hair the sheep because of its fine quality. Selective Breeding: Sometimes sheep are selected to gain a breed that has only fine soft hair on the skin and less or no hard hair. This process is called Selective Breeding. The sheep are generally fed with grass common leaves, call, pulses, oil cakes and dry fodder. Sheep are reared (breed and raised) all over India in order to acquire wool from them such as in Jammu and Kashmir, Rajasthan, Arunachal Pradesh and Gujarat. 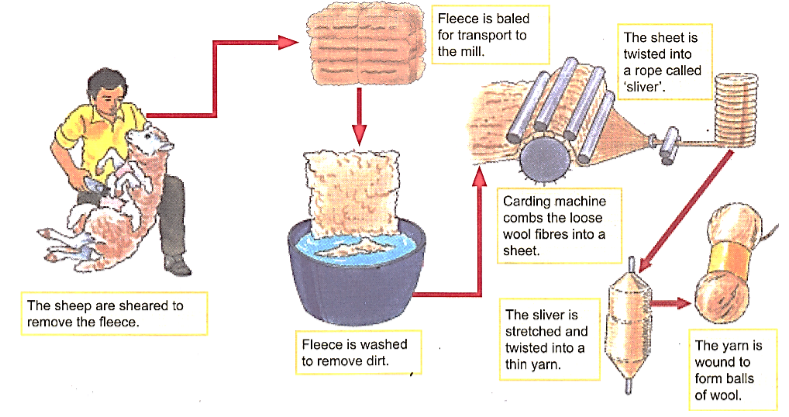 It is a process of removing the fleece of the sheep along with a thin layer of its skin. Shearing is conducted generally in hot weather so that the sheep do not feel cold and can survive easily. The shearing process does not hurt the sheep because the upper part of the skin is normally dead skin. It is a process of removing dirt, grease and dust from the hair removed from the sheep. It is generally done with the help of machines. It is the process of separating the hair of the sheep according to their textures. In this step, the burrs or small fibres present on the hair are picked out. Then the hair is cleaned and dried out. The product so obtained is the wool that can now be converted into fibres. In this step, the fibres are dyed in different colours. In the last step, the fibres for wool so obtained is straightened out combed and then rolled into a yarn. In some industries, the workers have to face risks of getting diseases and sometimes death. These are called occupational hazards. Sorter’s disease is an occupational hazard associated with the production of wool. The people who sort the wool can get infected by bacteria called Anthrax. This bacterium infects the blood of the person which can lead to fatal death. Silk is obtained from silkworms. Sericulture: is the breeding and raising of silkworms in order to obtain silk from them. When the eggs of the silk moth hatch larvae are produced called Caterpillar or Silkworms. The next stage of the caterpillar’s life is called the Pupa. To enter into this stage the Caterpillar weaves a net that can hold it. The Caterpillar then swings its head in the shape of an eight. As it swings its head ,fibre is secreted. This fibre is made up of protein and as it comes in contact with air it hardens and forms the Silk fibre. The Caterpillar then covers itself into silk and turns into Pupa. The covering of the Caterpillar is called the Cocoon. Then the Caterpillar turns into a silk moth inside this covering. The Silk thread on the Silk yarn is obtained from the cocoon. 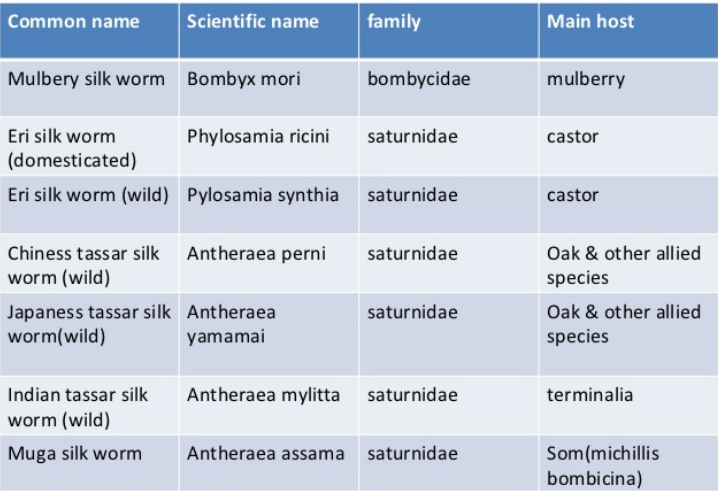 Different types of silk are obtained because of the different types of silk moths. 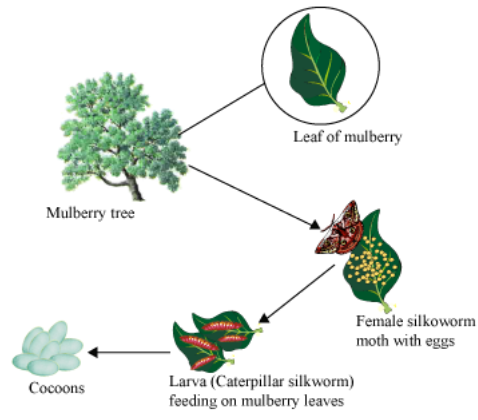 The Mulberry Silk Moth is the most common kind of silk moth that produces soft elastic and shining silk. 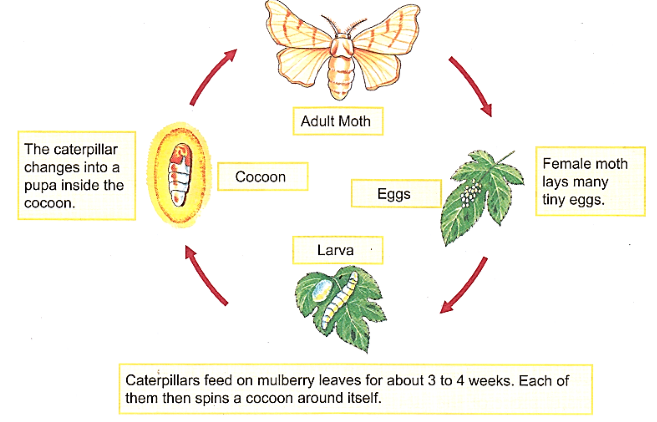 Rearing: the silkworm farmers buy the eggs of the Silkmoth and raise them. These eggs are generally large in numbers as a single silk moth can lay about 100 eggs at a time. These eggs are stored in an environment having an appropriate temperature, humidity and hygienic conditions. In order to hatch the larvae out of the eggs are heated. They are then kept in a bamboo tray. This process is conducted generally when the fresh leaves appear on the Mulberry trees so that the Caterpillar can get enough feed. The Caterpillar feeds for around 25 to 30 days and then moves into a chamber in the tray to build a cocoon. The cocoon when spun gets attached to the rocks present in the Bangalore train. Firstly, as the cocoons are acquired they are kept under the sun or boiled so that the Silk fibres can separate out from them. Then, the reeling of the silk takes place. It is a process in which the cocoon’s threads are processed to be used as silk. The silk fibres thus obtained are drawn and rolled into threads.